1. Change the subject line as the conversation evolves: Emails must always have an appropriate subject in the subject line, so the reader knows what the email is about. 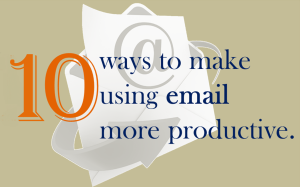 However, as email conversations go back and forth, the topic may change one or more times. Later, when you try to find information on one of the topics, you end up wasting time looking for a specific email because the subject line remained the same. The solution is to change the subject line every time the topic changes. Remind your team about this practice till it becomes a habit. 2. Keep sentences short: When composing messages, try to keep sentences shorter than twenty words. This makes your message easier to grasp and helps readers focus their attention on the points you are making. 4. Use lists and bullet points when possible: Group your ideas and choices into numbered or bulleted lists to facilitate faster comprehension. It will also make it easier for the receiver to respond. 5. Avoid constantly checking for new messages: Constantly checking—or feeling the need to keep checking for new email—is a major productivity buster. It distracts you from focusing on your work in hand. Unless your job requires it (for example, if you are in customer support), consider scheduling when you will check and act on emails, no more than four times a day. Some do this twice a day and it works well for them. 6. Use a pre-server filtering service: If you are not subscribing to a service that filters out spam and messages with malicious content before messages arrive at your mail server, consider doing so. There are many reasonably priced services and far more effective than what is built into email client software. Using this service frees you and your team from having to get rid of junk messages. 7. Automate email handling: Popular email client software include sophisticated features that can handle many tasks for you automatically. For example, if you receive informational messages that you may need to refer in the future, you can set up a routine to grab such messages, move them to a designated folder, and mark them as read, or to read later. Or if you belong to a distribution or alias group, you can have messages collected in a chosen folder for focused attention in one sitting later. You can even trigger a text message to your mobile phone when the most important messages arrive in your mailbox. To make full use of these features, take a look at the “Rules” for Microsoft Outlook, or “Filters” in Mozilla’s Thunderbird software. 8. Avoid bombarding people with immaterial messages: Only send messages to those who need to know and unsubscribe from lists that are no longer relevant. Encourage your teammates to do the same. 9. Use and fine tune clutter: If you use Microsoft Outlook, use and fine tune the “Clutter” feature designed to help you focus on the most important messages, by moving lower priority messages from your Inbox folder to a new folder named ‘Clutter.’ It is intelligent enough to grab newsletters and other types of emails that you regularly ignore. 10. Delete older conversations: As messages pile up, consider deleting previous messages when new responses come in with the same subject. This helps conserve disk space and declutters your mailbox.